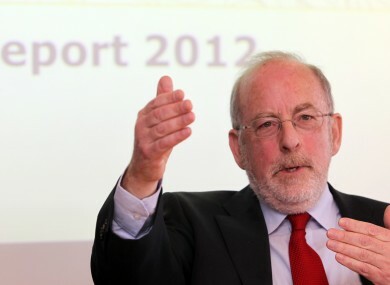 THE GOVERNOR OF the Central Bank, Patrick Honohan, is set to appear before the Oireachtas Finance Committee later today to answer questions on the mortgage crisis and the Anglo Tapes. Labour deputy Ciarán Lynch, who chairs the panel of TDs and senators, said earlier this month that he would be asking Honohan to appear to give his response to banks’ submissions on the solutions being offered to mortgage holders in arrears. The Anglo Tapes and the Central Bank’s surprise decision not to take any further action over the recordings of conversations between Anglo executives in the period surrounding the bank guarantee five years ago are also likely to be discussed. The CEOs from four banks were asked earlier this month to confirm to the committee whether they had had reached the target set down by Government to have proposed sustainable solutions for 20 per cent of struggling homeowners. All had – some by greater margins than others – but the politicians were surprised at the level of solutions that had been achieved as a result of legal action being launched: almost 15,000. Ulster Bank official Steven Bell even conceded to the committee that it was also a “matter of some concern” within management of his bank that the target was being met in such a manner, but he added that they had had confirmation from the Central Bank that it was clearly within the rules set out. Bell said that when a target was given and there were consequences for not meeting it, that “boards of directors will do whatever they have to do”. The banks have been asked to give a full breakdown of their resolution processes and how they have been applied to distressed borrowers in advance of today’s appearance by Governor Honohan. According to Deputy Lynch: “Other issues we will be looking at are how some of the resolutions reached with customers vary from one bank to another – for instance, some banks are using the option of split mortgage solutions more than others”. The meeting takes place in Leinster House Committee Room 4 at 2pm. Email “Central Bank Governor faces questions over banks’ legal letters and Anglo Tapes”. Feedback on “Central Bank Governor faces questions over banks’ legal letters and Anglo Tapes”.